Chevrolet used these on the High Performance trucks for 1992 & 1993! 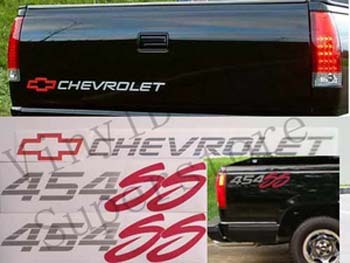 Tailgate decal is 2.8" x 32.8" with RED bowtie with SILVER CHEVROLET letters. These decals are NOT OEM factory decals. They are custom made and measure to original size. They are made of automotive grade vinyl that will not fade. A great alternative to pricey printed decals.